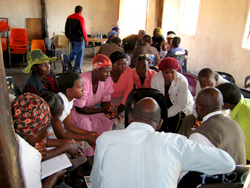 56 South African church leaders completed a six-week Hands at Work training program on July 9 on the church’s role in fighting HIV/AIDS and caring for widows, orphans and the dying. 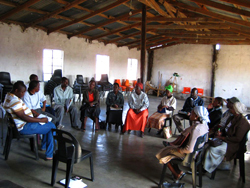 Situated in the province of Mpumalanga and bounded by Kruger Park to the east, the local municipality of Bushbuckridge is a neglected area that is suffering under the crippling weight of poverty, social disintegration, and HIV and AIDS. With the mandate to capacitate locals to care for the poorest of the poor in their communities, Hands at Work has committed itself to helping start up four new home-based cares and multi-care centres in the Bushbuckridge area. These new efforts are concentrated in the north-east corner of Bushbuckridge; encompassing approximately twenty villages in a 280 square kilometre area. The residents have very little access to government health and social services. The first step towards starting up these home-based cares is to mobilize the pastors and Christian leaders in the community to begin actively caring for the poor, sick, dying, and orphaned within their community. 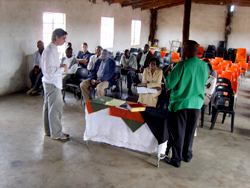 To do this, Hands at Work has developed a six-session training course that teaches on several topics including: how bad the epidemic really is, what can be done practically to address the effects of the epidemic, and the biblical mandate that the church has to care for the vulnerable, lonely, and oppressed. Included in the training is plenty of time to discuss what the church or others are currently doing in a community, what the needs of the community really are, and creative thinking about what specific actions can the participants currently undertake that will make a difference in the lives of those who are suffering in their community. In an effort to train one hundred pastors overall, we began by dividing the geographic area into two and then hold two courses of fifty pastors and Christian leaders. 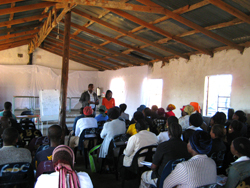 For the first session of training there were 43 attendants who came from nine separate villages to meet at a Church in Hluvakani. Although the number was less than we were hoping for, it was clear from the beginning that all those attending were passionate about caring for their community. With each consecutive week, more and more people were attending. In the end, fifty-seven people got certificates of completion and over seventy people attended the last two sessions. A third of these people used their own money for transport or walked, some from as far as fifteen kilometres away. Although catering was only provided for fifty people, all the attendants willingly shared the food equally. As the training progressed, the trainings became dedicated to long but fruitful discussions between the participants about how they could translate the knowledge from the trainings into practical actions that they could start now. The passion, energy, and excitement of the graduation ceremony (of which the camera crew from The Living Truth were active participants) have been carried out of the training sessions and have already begun to make an impact in the community. In a follow up meeting with the nine coordinators identified during the training, one from each village, it was clear that all have already started work. Already two groups of participants, one from Utha and the other from Hlakakahle, have gone to the other churches in their village, challenged them to become involved, and have mobilized nine and fourteen volunteers respectively to begin home-based cares. As we continue to follow up with the participants, we are also looking ahead to the next training course for the further fifty pastors and Christian leaders which is due to start in October. Teaching by example, several of the participants of this last training are going to play an integral part in the trainings in October. It is exciting to see the momentum generated through the trainings.